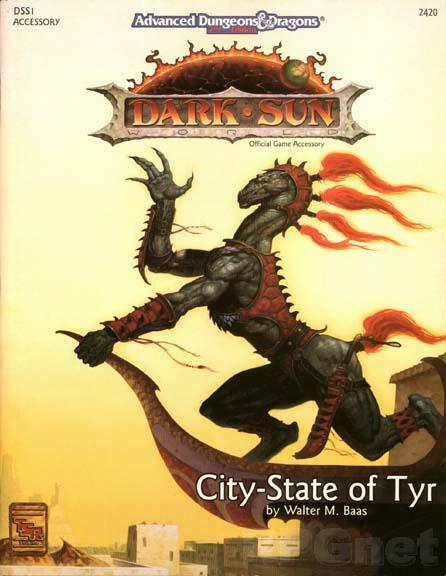 Recently WotC rereleased the Dark Sun setting for 4E. 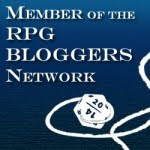 This article is part of a series that examines a release from 2E Dark Sun and sees how and if it can be integrated with the new 4E version of the world setting. The sourcebook we’re looking at today is the City-State of Tyr (DSS1), published in 1993. It is softcover and runs 96 pages. Included is a foldout map. As well as the Introduction there are 8 chapters and an appendix of maps. This publication is set after the death of King Kalak and after the events leading up to his death. Thus this is easier to integrate than other source material from 2E Dark Sun. The chapter starts off with a brief history of Tyr. This history is very brief and given as in-character conversations and thus tainted by the speakers opinions. At the very least this helps give some insight on who various factions felt about Tyr and its history. The next section is a timeline following the death of Kalak. This is where it skips ahead of where 4E Dark Sun starts. Here Urik has already attacked the Iron Mines and the Dragon’s levy was not paid. The Council of Advisors has also been created, which has not happened yet in the 4E version. There are a few was to handle this jump in the timeline. 1) Ignore the jump and stay with the 4E timeline; 2) Incorporate the timeline and jump the 4E timeline forward; 3) Use the timeline as a source for upcoming adventures. Thereafter, the book talks about the government and politics of the city focusing on King Tithian and the Council of Advisors. As already mentioned the Council has not been formed yet. However, the names of many of the movers and shakers of the various power groups are mentioned, including several that are to be found in the 4E sourcebook. You could tell that the designers of the 4E sourcebook lifted almost directly a lot of the names and places from the original version. This is a good thing as it makes any use of the older material here that much easier to integrate. While the Council is not an actual governing body yet, the various factions are still here and given in a bit more detail, especially the Templar section, which lists the various duties they are now doing within the city and the specific templars assigned to head them up. This level of detail will make crating adventures easier and add more detail thus bringing it more to life. Next up is a short section on Crime and Punishment. It is rather sparse and only skims the topic. After that is a section on Trade and Commerce; again an overview. Also included is the topic of Water, with much the same information as the 4E version. This chapter covers the area around Tyr. There is some general information followed by the Iron Mines. This section goes into a lot of information about the Iron mines and even includes a map of the area and a table of Random accidents. There is enough information here to easily run several adventures set at the mines. The next section details the Agriculture of the surrounding area. There is some dry information about how the farming lands are divided up among the populace. Of more interest are the various Farming Plants detailed. It would be easy to make a few adventures based off this information and adds otherworld details (the plants are foreign to Earth and thus the players). Here we start getting into the nitty-gritty of the city itself. First up is a section on City Culture and it quickly covers the topics of Architecture, Furnishings, Illumination, Refreshment, Foods, Lodging, Stables, Dress and City Emblems. These help to mesh Dark Sun with the city and add a lot of details to help flesh out the feel of the city. Next up are the Tradesmen’s Districts. There is the Caravan District, Artisan’s District and Smith’s District. It has the same information on several of the inhabitants as the 4E version, while both versions have some unique locations. For example the Caravan District in 4E lists Deyn’s Desertwear, Grik’s Weaponry, Golden Inix, and Ezar’s Storehouse as locations. 2E lists the Caravan gate, Draqoman Station, Grik’s Weaponry, Messenger’s Mount, Golden Inix, and Shining Sands. The extra locations will of use for a GM and, in fact, the City-State of Tyr sourcebook has more detailed information on the locations that appear in both books. Next up is the Merchant’s District. This is eerily the same as the 4E book. It lists the various houses. The eerie part is that the Houses are listed in the same exact order (i.e. not in alphabetical order). The 2E version has 2 extra Houses, but the Houses are the basically the same between versions. For example, House Tsalaxa is still an evil House between the two sources; heck you could lift some of the descriptive text directly out of the 2E book and it would directly match the 4E description. Next up are the Noble District and the Warrens. Like the previous Districts the information has some old and some new information between the two sourcebooks, but the description of the Warrens is far more expansive and detailed than the 4E version. Those sections are followed up by a description of the Stadium. The 2E sourcebook goes a lot into the Arena Market and provides a large list of traders and their goods, something the 4E sourcebook does not do at all. This is a something extra that can be used for any adventure taking place in the Arena Market. In addition, the 2E book goes a little more into the gladiator games and provides two tables for potential combatants. There is a table for Single Combatants, which can be used to provide an opponent, but you’ll have to provide the combatants stats yourself. The Creature Combatants for the Arena is also of use, but some of the listed creatures are not included in the Dark Sun Creature Catalog so you’ll have to swap the creatures up. At least the table provides for some ideas. The chapter ends with a brief description of Kalak’s Ziggurat and follows closely the 4E source material. This chapter details the Golden City and is only briefly covered in the 4E sourcebook. As opposed to the 1 page in the 4E sourcebook, this book provides 5 pages of information. It covers much the same information, but goes into more detail at each part. This is especially noticeable when they describe the Golden Tower. While the book doesn’t give a room by room description it does list of the levels and describes what is on each level. It would be easy to run something within the Tower with this extra information. This is similar to the 4E version. Some of the sites are the same between the two, but some are not. This product has listings for The Sorrows, Crimson Shrine, Poison Sting, Elven River, Belly of the Noble, Mercur Fountain, Tembo’s Teeth, Crawl, and Farin’s Passages. There is also a Random Encounter Table from which most of the monsters can be found in the Dark Sun Creature Catalog. The 4E version lists The Sorrows, Elven River, Belly of the Noble, Tembo’s Teeth, Crawl, Road of Crypts, and Night Dragon Way. There is no map at all in this sourcebook for UnderTyr, but if used with the 4E book a GM will have a lot more to work with when designing adventures here. Here the book begins to diverge more from the 4E sourcebook and starts to provide information that the 4E book simply does not cover at all. It starts by describing the School of Thought, a psionic training facility. It lists the costs to learn, as well as NPCs from the school, including names, backgrounds and stats. Obviously the stats will not work, but they do provide a good idea of where to start if you were to design the NPCs yourself. There is another psionic organization called The Order. A background for the organization is provided as well as a description of the leader of the group. The sourcebook then goes into the topic of Magic and gives us some more information about the Veiled Alliance. It provides a limited look into the inner workings of the order, including an adventure seed about dissension amongst the group as to how they should proceed since the death of Kalak. The chapter rounds out with the topic of Religion, as in there isn’t any really, though it does make mention of two druids outside the city that guard a Tarn. 4E Druids are different from 2E druids, but the NPCs will still fit easily into a campaign. This chapter provides us with a bunch of NPCs (15 total). While the stats are by and large useless, the NPCs have detailed backgrounds that make it easy to insert them into a Tyr campaign. Many of these NPCs could be catalysts for adventure within and without the city. This is a smorgasbord of information, some of it specific to the 2E rule set. It starts with Character Kits. In some ways these function similar to the new Character Themes. Of interest is a new character kit, the Draqoman. The Draqoman is essentially a guide within the city. I’m not sure how viable they would be as a new character theme, but I can see some potential. If nothing else, a DM can use the kit as the basis of an NPC character. Next up is a short section on Character Interaction or more specifically, how characters can interact with NPCs and the city itself. It provides some broad adventure ideas and some more specific ideas based on a character’s class. Following that is a superb section dealing with Adventure Suggestions. This is 9 adventures that can be run within the city that help to capture the feel of the city. You would to flesh out each of these adventures but there is more than enough to go on with each of them. After that we get to some random tables for encounters set around the city, specifically outside the city walls. The tables can be mostly as they appear. You might to hunt around for the monster stats, but most of them will be found within one of the available monster manuals. The chapter is rounded out by a Tyrian Trade Goods Cost Table. This is a list of the trade goods found throughout Dark Sun, but tailored to Tyr’s resources. However, the prices are far off from the 4E sourcebook. I’ll let someone else work on any conversions of gold value between the two editions, but the table is good for an organized look at goods found within the city. At the end of the book are two maps detailing the city. Comparing the maps to the one included with the 4E sourcebook, the 4E fold-out map is far superior. The 2E maps do not show the entire city, only showing a couple of sections, and looks to be incompatible with the 4E map. This is a detailed map of the Golden Tower and its associated Observatory Tower. Each level is shown on the map and each room is given a number and room name, such as 8) Private Library and 18) Meeting Room. While there are no actual detailed descriptions of each room it should be easy to add the details yourself. Either way it is nice to have maps for such a location. The towers could be excellent adventure locations. The players may have to stop an ambush there, chase assassins through the place or be tasked to retrieve something from the towers. The map will help a lot in these regards. These are several pieces of artwork to be found within the book (17 total). Most are done by Tony Di’Terlizzi. I personally like his style, but it is a different style than what we have seen so far in 4E. Some pieces of the art won’t work, but some can easily be photocopied and shown to your players as a set-the-mood piece or as a frame for the adventure you are running that night. Overall: This product would be a lot of use for those using Tyr as a major focal point in their Dark Sun campaign and since Tyr is the default starting point and catalyst in Dark Sun politics this is likely. The corresponding information in the 4E sourcebook can mostly be found in the section Tyr, The Free City. It should be noted that in the 4E sourcebook the information on Tyr covers 10 pages as opposed to the 96 in the 2E sourcebook. Therefore, there is a lot more information to be found about the city in the older version. If you are into details (and really, every good GM should be) and are planning to run any adventures in or near Tyr, this is an excellent book to get a hold of.